NIA CHARLESTOWN NEVIS (April 23, 2018) — Hon. Spencer Brand, Minister responsible for Water Services on Nevis is describing a meeting with a team from the Caribbean Development Bank (CDB) as frank and fruitful. 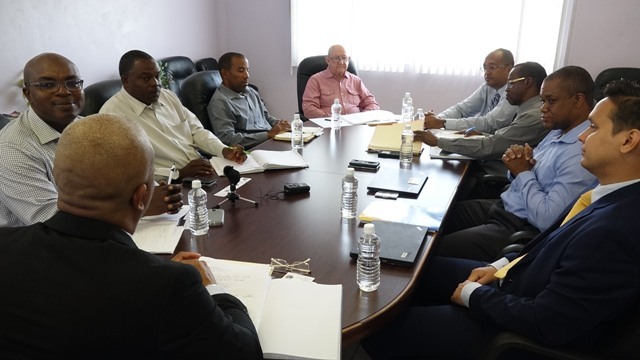 The Minister said on April 23, 2018, on the heels of the meeting at the Ministry of Finance Conference Room on April 19, 2018, the discussions were centred on the ongoing Nevis Water Supply Enhancement Project which is funded by the CDB. “I think the CDB meeting was frank and fruitful and I think there is a much clearer understanding of where we are with the Nevis Water [Supply] Enhancement Project as we try to wrap it up. Our aim is to close the project by the end of 2018,” he said. At the meeting, Mr. Brand thanked the CDB for recognising the importance of the project to the island of Nevis and its people. “I believe that it would be fair to say that this project has been a project that has touched the lives of every man, woman and child on the island of Nevis and it has placed Nevis in a position where our development prospective has significantly been enhanced. 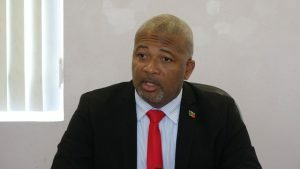 “So I want to, on behalf of the Premier and the Cabinet and the whole of Nevis, say how grateful and thankful we are to CDB for partnering with Nevis to make sure that this project comes to fruition,” he said. Mr. L. O’Reilly Lewis, Division Chief in the Economic Infrastructure Division at the CDB, who led the four-member delegation, acknowledged that the bank is a long-time partner with the government of St. Kitts and Nevis and has had extremely good working relations with Nevis in particular where the issue of water is concerned. The CDB official spoke to the project on Nevis which he stated has been going on for a long time. He said the bank is pleased that it has been able to manage the challenges that it has been presented with and has been able come up with an outcome that benefits and improves the water supply because water is a fundamental need and a pillar of the development of any country. The other members of the CDB team from the Division were Mr. Whitfield Clarke, Operations Officer (Civil Engineer), Mr. Peter Manning, Operations Officer (Analyst) and Mr. Lano Fonua, Operations Officer (Energy). Accompanying Mr. Brand were Dr. Ernie Stapleton, Permanent Secretary in the Ministry of Water Services; Mr. Denzil Stanley, Principal Assistant Secretary in the Ministry; Mr. Roger Hanley, Manager of the Nevis Water Department and Mr. Bryan Kennedy, Project Coordinator.